Hexus is rated 4.4 out of 5 by 25. Rated 5 out of 5 by radarsweet from Help! I Can't Stop Playing!! I originally bought this for my iPad, & loved it so much I got it for my PC. This game is loads of fun; it is also very challenging. I won't go into the story-line, as I think it's secondary to the game. The challenge of making lines of six (rather than a match three game) can be challenging & fun. I don't know how many times I've played the game through all 100 levels, but it still keeps my interest, & I still find it challenging. It makes you stop & think about what the best move would be, So get this game! it'll be a great game to add to any collection. I'm hoping Hexus II will soon be coming. Rated 5 out of 5 by ptbfish from Many Puzzles to Solve I am at level 68 and still intrigued. I will agree with other reviewers who said that the tutorial leaves much to be learned by trial and error. For me, that was part of the challenge. I love that this is UNtimed, and I can take as long as I want to figure out my next move. I would describe this as a combination match-3 and strategy. The city building, and dressing your avatar is secondary, IMO, to meeting the goals of each level. I also like the variety of side games, which they call "quests", and that you can skip them. The artwork in the jigsaw puzzles, in particular is dreamy and imaginative, like scenes from Egyptian royalty. 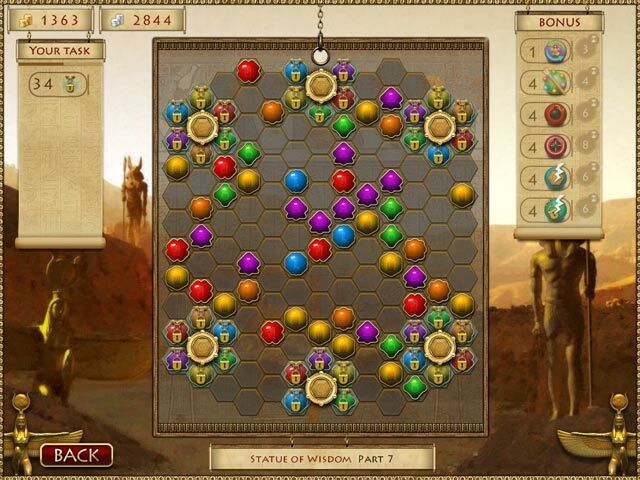 Since it is an older game, you won't find many tips or hints in any forums, however, experimenting usually reveals how to use the bonus pieces, or how to unlock a board. Play on- for hours of enjoyment! Rated 5 out of 5 by AdrianaIP from Devilishly hard This starts easily enough, with a gameplay that I have not found anywhere else. And then it gets complicated. Don't be surprised if you get lost at a certain level, and have to sweat it out. Planning, strategy, and luck, and plenty of time will get you through. Good logic game for all people with patience. Rated 5 out of 5 by betskand62 from Great game, hard to categorize This game involves matching colored stones, but it is not a Match 3 type game. It is more like a board game. You try to cluster 6 or more stones of the same color, and when you do, they are removed. The process is complicated by the fact that with every move that does not result in a removal, more stones appear, so it requires minimizing moves. A win results in money to build an Egyptian city (also to outfit your trophy room and buy you clothes.) Every building yields taxes. I LOVE collecting the taxes! My only complaint is that I would like much more ground to build the city on, because it's so fun. But there is actually quite a lot provided. Rated 5 out of 5 by roesbud from Simply the best Of all the match 3, build something games I've played this is by far the best. Took at least 20 hours to complete. It has a bit of everything... Try it, I'm sure you'll like it. Rated 5 out of 5 by lvgames7 from Unique & a Blast to Play! I honestly did not know if I would like this game until I started playing it. 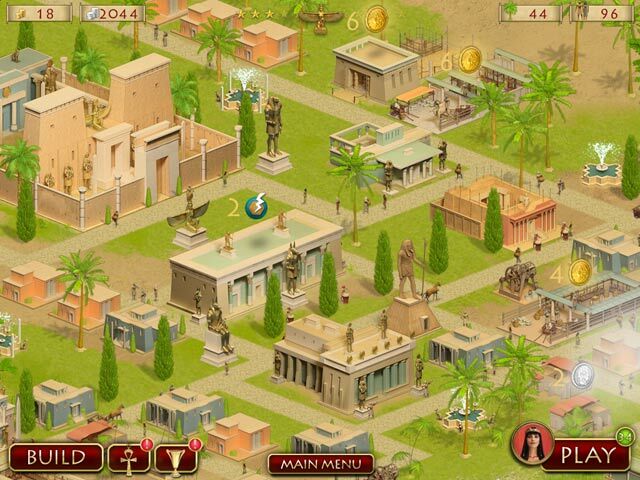 Instantly I was drawn into the storyline and the building of my Egyptian city. 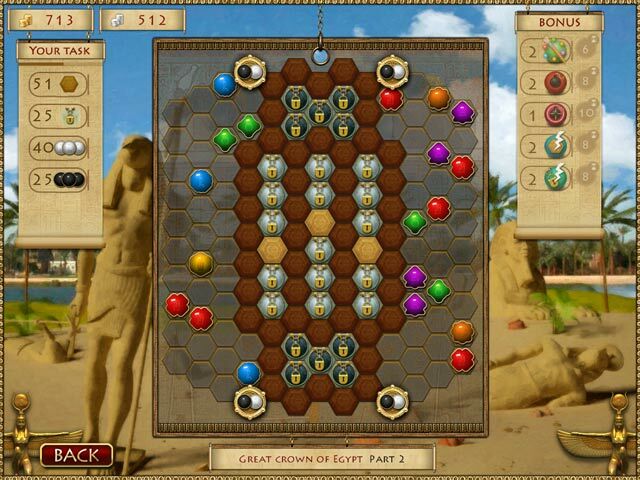 This game integrates a fun color matching game in which you accumulate money to buy and purchase buildings, structures, foliage and to dress/decorate yourself as the king/queen/pharaoh. Additionally there are other occasional challenges to match images and play a game of memory. The visual quality is realistic and not "cartoon" like, which adds a great quality to the storyline. I recommend this game for the entire family - fantastic game! Rated 5 out of 5 by abqrose from Cool Game I purchased this game after playing the free trial..and its been alot of fun to play. Its a combination of M3, BubblePopper, City building, with HO puzzles and a few other puzzles as well. The game has been very intertaining and is a bit addicting even, seeing as how I have played it almost every day for the last week. I have quite the city built too. Have fun!!! 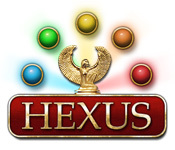 Rated 5 out of 5 by denenid2 from Hurrah for Hexus I agree with 10 out of the 11 reviews for this game & give it 5 stars. it is the best match 3 game ever. challenging with great side puzzles it makes you think without being over the top I bought this game on the recommendation of other reviews and have not been disappointed. I like the fact that it is a little different from most mach 3 games and gives you a chance to earn money to build a city and dress your profile which is fun.I love the sneaky HOG find the difference & Mahjong puzzles just to add to the game. I love it I would recommend it to all levels of competence. great going BFG. Rated 5 out of 5 by nkosi from THE BEST GAME EVER I bought this about a week ago and as far as I am concerned it is the VERY VERY BEST game I have ever bought from BIG FISH my only though is when will HEXUS 2,3,4, ETC. BE OUT. it IS EVERY THING i NEED IN A GAME, HIDDEN OBJECT, MATCH3 PUZZLES AND BRAIN "POWER". I am dreading to finish it because then what do I do?! Any suggestions on similar games but as good, meaning graphics etc>? I was an intermediate but now an expert from playing this amazing game! Rated 5 out of 5 by Lyndy20 from Wonderful game Hexus is a mix of matching and city building. The matching is different from the usual M3 in that you move the balls around the board to make matches of 6 or more and there are different goals to achieve for each board. The city building aspect is freestyle - my favourite type. There are a variety of mini-games, all Egyptian themed. There are also two bonus games to play. All in all, a long, engrossing game with high replay value.